Some products recommended by ourbabydays.com for babies 0-6 months from popular online retailer Amazon. If you wish to buy any of the recommended products, or find out more about them, please click on the product image which will take you to the Amazon store. Bugaboo donkey 2 mono stroller. This is a very popular choice for new parents due to its versatility. It can be used as a single pram/stroller for a first baby and then adapted into a double pram/stroller for toddler and baby (when another baby later arrives) saving the cost of buying a double pram/stroller (only the extention kit needs to be bought). It can then be returned back to a single pram/stroller later, perfect for adapting to a family's changing needs. It can also be used as a double pram/stroller for twins by purchasing extra seating / bassinet with the extension kit. This comes with spacious storage under seat and side storage. It is car seat compatible, for easy transfer, and has foam filled wheels that never need pumping up and can easily manage most surfaces. Suitable from birth to approx 3 years old (dependent on the seating used) and extra features can be purchased additionally. Please note: to use as a double pram/stroller the extension kit needs to be purchased additionally. Double twin carrier for multiples. Suitable from birth to approx 12 months. Can carry 2 babies at the same time. Perfect for when you are out and about and don't want to take a pram/stroller. Can be used as a single or double carrier and includes an attached baby nappy/diaper bag and bottle pockets to save carrying a separate changing bag with you. Easy to use following instructions and comfortable to wear, making going out with 2 babies much easier. Wide, padded waist belt disburses weight comfortably and evenly for optimum support. Available in unisex khaki colour. This newborn (0-3 months) 26 piece starter set includes everything needed for baby's first few days. Set includes 5 bodysuits/vests, 2 onesies/babygro, 2 gowns, 5 hats, 2 pairs of socks, 2 pairs of mittens, 3 feeding/burp cloths, 3 bibs. Gender netural colours with cute teddy designs. Materials: mix of cotton polyester. This newborn (0-3 months) 19 piece starter set includes essential items needed for a baby's first few days. Set includes 5 bodysuits/vests, 2 onesies/babygro, 5 hats, 3 bibs, and 4 blankets. Budget friendly gender neutral colours with cute teddy designs. Materials: mix of cotton polyester. Tommee Tippee nappy/diaper bin. A bin to put used/soiled nappies/diapers. This bin comes with refill packs of liners that keep the environment free of odours and germs. The bin holds up to 18 used nappies/diapers before needing emptying. Multi packs of water wipes for baby. Good value and budget friendly. Water wipes are gentle and as pure as water on a baby's skin. Perfect for newborns and babies with very sensitive skin. Contain only 2 ingredients: 99% pure water and fruit extract (no alcohol or fragrance). Baby change bag available in a few different colours, more of an investment buy than a budget friendly item but is durable and hardwearing so will likely last for a few years. Includes a insulated bottle and washable padded changing mat. The bag has wipe clean lining throughout for any leaks or spills. Also has handy integrated pram/stroller straps to fix onto the handle if you do not want to carry the bag when out and about. Spacious with a few compartments to fit various items for baby and or toddler. Winnie the Pooh changing mat. For use when changing nappies/diapers and dressing baby. Can be used on the floor or on a standard changing table. Neutral colour soft mat with classic Winnie the Pooh picture design. Waterproof, wipe clean, padded for extra comfort, phthalate free. Suitable from birth. 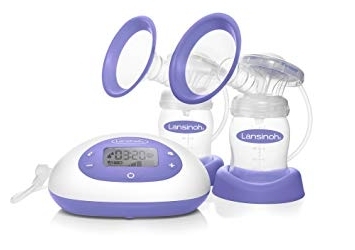 Electric breast pump. Collects breast milk in a few minutes, making it convenient for breast feeding mums that want to express. Can be used singularly or as a double pump. 3 different pumping styles and 8 different suction levels to suit the individual. Milk can be stored in the fitted expressed milk bags and then be kept in the fridge or freezer. Extra milk bags can be purchased additionally. BPA free. Tommee Tippee electric sterilizer can hold up to 5 bottles and also sterilize dummy/pacificer and teething rings. Chemical free. Needs only water, then steam kills up to 99% of household germs and keeps bottles sterile for up to 24 hours in the sterilizer with the lid closed. Electrically powered and takes only 5 minutes to fully sterilise equipment. Adjustable breastfeeding pillow suitable from birth. Can be adjusted to suit height and weight of baby, preventing aches and pains in arms, back, and side for nursing mother when feeding, making feeding more comfortable. Can be machine washed and tumble dried at low temperatures. Portable to carry around. Tommee Tippee newborn anti-colic feeding set. Includes a bottle warmer, microwave sterilizer, insulated bottle bag, 4 anti-colic bottles, bottle cleaning brushes, bib and dummy/pacifier with holder. Ideal for starting bottle feeding with a newborn, whether breast or formula milk. Award wining slow flow teats and heat sensor anti-colic tube. BPA and Phthalate free. Budget friendly and good value for money. Ewan the dream sheep. Plays soothing and calm sounds to aid a baby to sleep. Gender neutral colour with soft pink glow when active. Plays actual sounds of the womb and heartbeat and plays for approx 20 minutes. Suitable from birth and can be attached to cot, pram /stroller, or car seat. Other sounds can be combined for older babies. Set of 3 swaddling blankets. Soft and breathable material 100% cotton. Lightweight materials keep baby comfortable and prevent over heating. Swaddling blanket helps babies to feel safe and secure during sleep, aiding longer sleeping patterns and more restful sleep. Can be used from birth. Clair de lune moses basket/crib. Suitable from birth to approx 6 months depending on weight and baby's mobility (not suitable once baby is rolling over or pulling themselves up). 100% super soft cotton material. Includes removable hood, padded liner, cover, mattress and carry handles. Gender neutral colours, cozy and soft sleeping area for a newborn. Stand can be bought seperately. Play nest and activity gym. Suitable from birth to approx 1 year old. Inflatable ring is covered with a soft and colourful cover, with over head bars and hanging toys. Toys and activities are of different sounds and textures to encourage a baby's interest and hand and eye co-ordination. Baby can sit in the centre of the ring, supported by the sides, to play. Cover is machine washable and ring can be deflated for storage. Fisher Price Baby rocker chair. Can be used from birth to toddler as seat adapts as baby grows (suitable for weight 6-40 pounds). Can be used as a safe entertainment area for young babies, for feeding of older babies, and as a seat for a young toddler. Has a detachable activity bar, 3 point harness, and 2 reclining positions. Has a switch-on soothing and calming vibrations. Requires batteries. Cover can be machine washed. Tummy time prop and play mat. Soft plush mat is designed to aid physical development by providing prop pillow support for tummy time, includes easy to reach toys and a baby safe mirror, making play and tummy time easier and safer. Also aids all other areas of development. Suitable from birth to approx 3 years of age. Mat is machine washable and durable. Padded baby play activity (suitable from birth). This is a thickly and softly padded 4 in 1 interactive mat and play area. 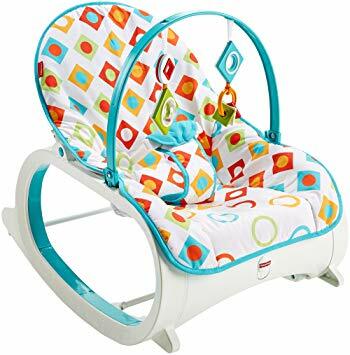 Baby can be placed on the padded mat to be entertained by detachable musical toys and light up activities. Mat can be used as a cozy space for newborn and play gym or tummy time area for babies 3 months and over. Is useful in aiding all areas of development. Baby Einsten octoplush toy. Soft and cute educational toy suitable from birth. The octoplush will play music when hugged or held, and each leg introduces a different colour when squeezed for learning and aiding development. Colours can be spoken in either English, French, or Spanish. Requires 2 AA batteries. Not machine washable so should be wiped clean with a damp cloth. Ideal toy for young babies and toddlers. Set of cloth baby books. Ideal as first books for babies. High quality handmade soft materials are perfect for babies to grasp and hold to look at. Includes crinkle noises and different activities on each page to aid all areas of development. Great for encouraging and beginning story time and interest in book from birth. This pack of 6 books is durable and long lasting as well as providing opportunity for learning and entertaining babies. Suitable from birth upwards. Fisher Price soothe & glow owl. Suitable from birth. This soothe and glow owl is soft and cuddly with soothing sounds to comfort baby. Plays 15 minutes of soothing tunes. Made of knitted and soft plush fabric. Sounds activated by baby or adult holding and squeezing the owl. Teethable feet, cute item. Perfect for young babies and great as a gift. Requires 2 AA batteries.